Click here to visit our parent website for the most up-to-date product details. The M4 trading platform is a professional trading application that is supplied with complete source code. You can purchase M4 by paying a one-time license fee, then customize the application to your exact specifications and rebrand it as your own software. You may then redistribute the compiled application without paying extra license fees or royalties. M4 is available as either VB.net, C# or VC++ source code, so you can choose to work with the language that you are most comfortable with. If you are considering a ready to go, white-label trading platform then look no further. M4 will save your company 8,500 development man-hours, which equates to over $100,000 in savings at just $15/hr or well over $340,000 in savings at $40/hr. M4 is Simple, Felxible and Affordable! We offer three versions of M4. The front-end user interface is available in Visual Basic .NET (VB.NET), C# and VC++. We feel that the VC++ version offers a familiar setting for experienced VC++ programmers, while the VB.NET and C# versions makes user interface customizations very simple and cost effective. In all versions, the CPU intensive back-end code is written in VC++ for the highest possible performance. Back-end code includes the charting engine, technical analysis functions and the scripting language. See the process diagram below. Everything about M4 is completely customizable. All windows, menus, toolbars, charts, and features can be modified, enhanced or removed with ease. Because you get complete source code for both the front end (VB.NET, C# or VC++ for the User Interface) and the backend (VC++ for the charting engine, scripting language, technical indicators, database engine, etc. ), you can make modifications yourself or you can hire developers to make modifications for you. M4 can be configured based on your unique needs and budget. We offer an affordable perpetual license with source code priced at just a fraction of the $100,000 fee that other platform software companies charge without source code! With M4 the time to market is faster and the total costs are far less than even using open source libraries and paying for outsourced development. 1. The first tier of M4 is the trading client front-end, which includes order entry, real time charting, alerts, back testing, scanning/screening, etc. Both a .NET desktop application and a Windows Mobile application are provided with complete source code, so you can make any number of customizations to these applications. 2. The second tier is the M4 server, which is a .NET web service that may either be hosted on your server or hosted on our servers. An inexpensive server will suffice. This tier is responsible for handling client data (window settings, trade logs, reporting, instant messaging, license keys, etc.) so the load on this server is minimal. All data is encrypted prior to arrival. The provided administration utility allows you to generate account reports, send instant messages, create license keys, deactivate users and so forth. 3. The third tier is an optional real time database server capable of storing real time tick data, simultaneously broadcasting the tick data out to M4 clients and handling historic data requests all in real time. This server is capable of handling multiple exchange head ends or data feeds and aggregating all the data into one source. This tier is used only if you will be hosting your own data. 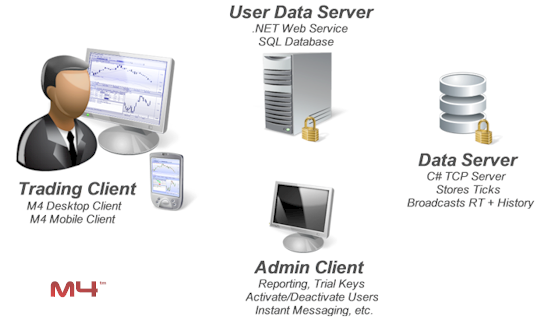 Alternatively, the M4 client may connect directly to a data provider such as eSignal, Barchart.com, DTN, etc. If your broker or data provider is not supported we may program the APIs into M4 at no additional cost. Contact us for details. M4 has already been subjected to thousands of hours of QA testing, load testing and real-world usage by actual traders so that you can spend less time testing and debugging. Click here to view a demonstration of the M4 platform. Then, contact us and we will consult with you and your team to show you the features and benefits of the M4 trading platform plus offer tips for customizing the M4 platform to best suit your needs. No matter if you are a brokerage, financial institution or an individual professional trader, you will certainly benefit from the information provided in our presentation. Topics covered may include data feeds, order entry systems, server design, hardware design, network design, protocols, software design and development, project management, project budgeting plus anything else you would like to discuss.